With Bean's passing, only four of 12 Apollo moonwalkers are still alive — Buzz Aldrin, Dave Scott, Charlie Duke and Harrison Schmitt. Schmitt, the lunar module pilot for Apollo 17, was one of many astronauts who mourned Bean's death and paid tribute Saturday to his accomplishments that blazed trails for future space exploration. "His enthusiasm about space and art never waned. 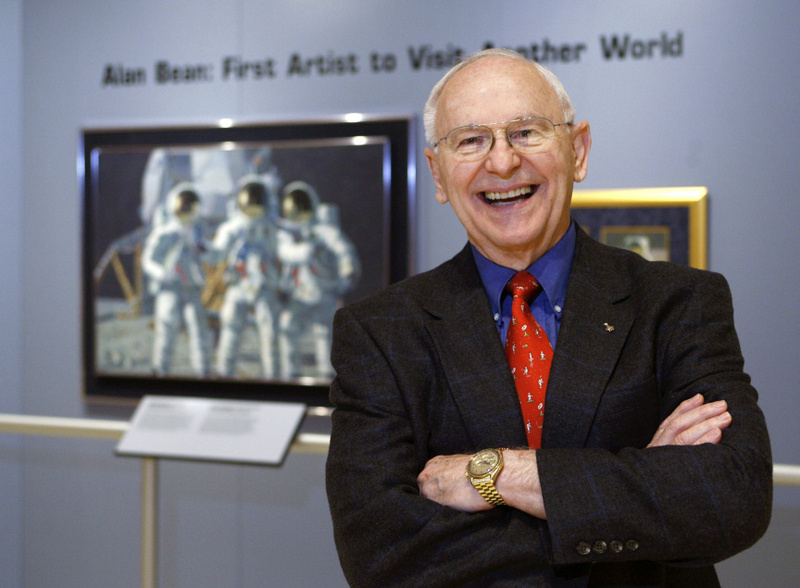 Alan Bean is one of the great renaissance men of his generation — engineer, fighter pilot, astronaut and artist," Schmitt said in a statement, adding that the wide array of lunar samples Bean helped collect from the moon was "a scientific gift that keeps on giving today and in the future." In 1998 NASA oral history, Bean recalled his excitement at preparing to fly to the moon. "When you're getting ready to go to the moon, every day's like Christmas and your birthday rolled into one. I mean, can you think of anything better?" Bean said. After Apollo, Bean commanded the second crewed flight to the United States' first space station, Skylab, in 1973. On that mission, he orbited the Earth for 59 days and traveled 24.4 million miles, setting a world record at the time. Born March 15, 1932, in Wheeler, Texas, Bean received a Bachelor of Science degree in aeronautical engineering from the University of Texas in 1955. He attended the Navy Test Pilot School and was one of 14 trainees selected by NASA for its third group of astronauts in October 1963. "I'd always wanted to be a pilot, ever since I could remember," Bean said in the 1998 NASA oral history. "I think a lot of it just had to do with it looked exciting. It looked like brave people did that. I wanted to be brave, even though I wasn't brave at the time. I thought maybe I could learn to be, so that appealed to me." "Alan Bean was the most extraordinary person I ever met," astronaut Mike Massimino, who flew on two space shuttle missions to service the Hubble Space Telescope, said in a statement. "He was a one-of-a-kind combination of technical achievement as an astronaut and artistic achievement as a painter." Retired U.S. astronaut Scott Kelly said the world had not only lost "a spaceflight pioneer ... but also an exceptional artist that brought his experience back to Earth to share with the world." Kelly added: "Fair winds and following seas, Captain." "As a girl who grew up with passions for spaceflight and art, Alan Bean was my hero," she wrote. "I feel fortunate to have met him." Retired astronaut Clayton Anderson tweeted "#RIP Alan Bean. Thank you for letting me stand upon your shoulders." Bean's wife of 40 years, Leslie Bean, said in a statement that Bean died peacefully at Houston Methodist Memorial Hospital surrounded by those who loved him. "Alan was the strongest and kindest man I ever knew," she said. "He was the love of my life and I miss him dearly."